Four years ago when photographer Klaus Enrique Gerdes was working on a series depicting different parts of human anatomy, he was shooting an eye surrounded by thousands of dried leaves. As he observed the scene, he noticed one of the leaves looked like it could be a nose belonging to the eye. 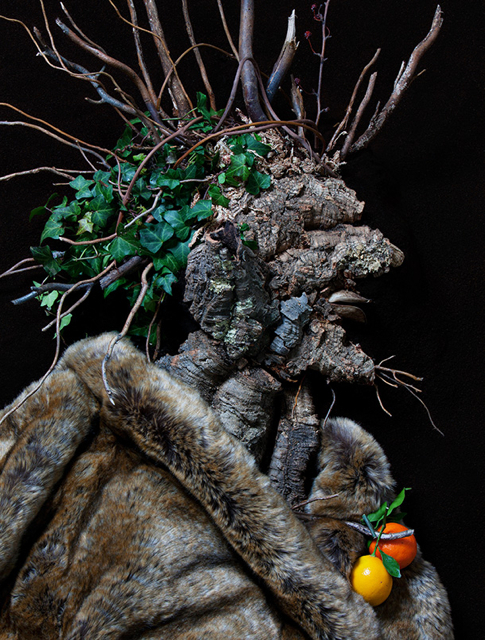 It sparked an idea of creating a face of dried leaves and, as he does with any new project, Gerdes began to research similar work done by other artists. 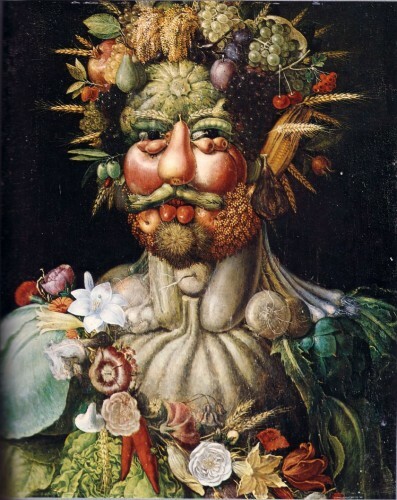 He soon discovered Giuseppe Arcimboldo, the 16th century Italian painter best known for creating portraits of heads made entirely of fruits, vegetables, flowers etc. such as his famous Vertumnus below. Initially disappointed that someone else had conceived of and executed the idea so magnificently, Gerdes continued to pursue the concept. 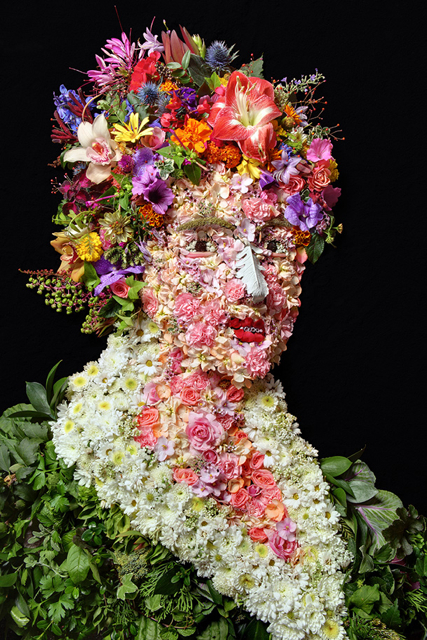 He discovered that Arcimboldo was not the first to create composite heads nor the last, as he went on to influence 20th century Modernists and Surrealists such Pablo Picasso, George Grosz, Rene Magritte and especially Salvador Dalí. 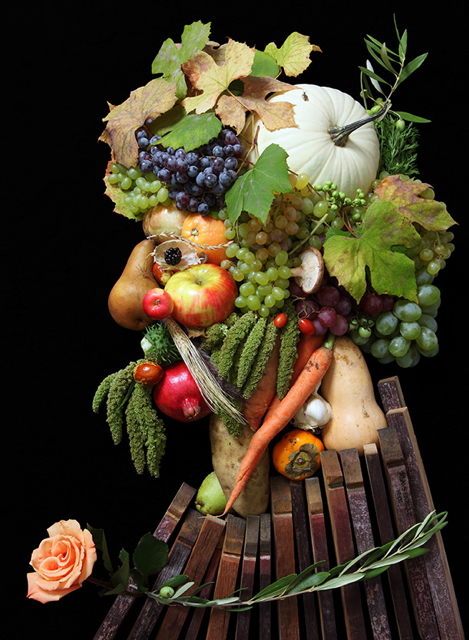 This history somehow gave Gerdes the freedom he needed to create his own series, inspired by his initial “aha” moment and which, in homage, he named “Arcimboldo”. Gerdes comes to his work with a unique perspective. With a honors degree in genetics from University of Nottingham and an MBA from Columbia, he clearly has an analytical mind and one which sees unusual connections, not to mention an incredible visual acuity. The amazingly detailed planning and beautiful artistic interpretations result in this remarkable series. He has since also studied photography at Parsons and the School of Visual Arts. And will be showing at the prestigious Aipad photography show at the Armory in NYC at the end of March 2012. I know I will be looking forward to seeing these stunning photographs in person then. Gerdes may think so but I can’t imagine much improvement in these incredibly creative and intricately constructed pieces of art!! 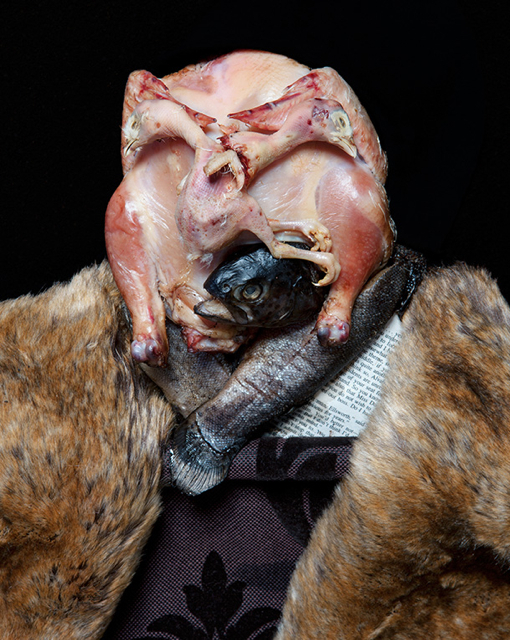 This entry posted in art, art history, photography. 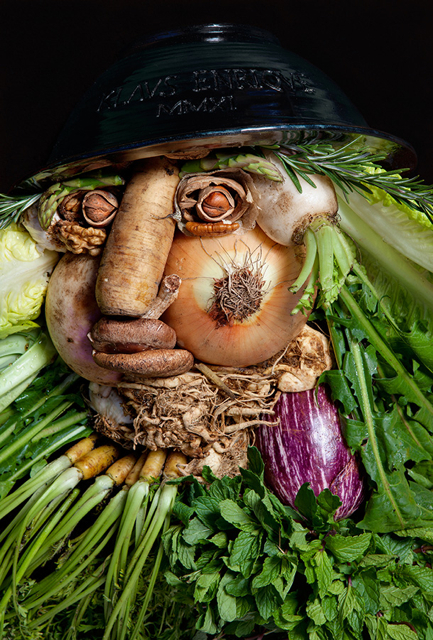 Entry Tags: Giuseppe Arcimboldo, Klaus Enrique Gerdes, Vertumnus Bookmark the permalink. I love the photographs so much more than the original paintings. So vibrant. Thanks for sharing these, Stacey! This is a wow. Stopped dead in my tracks. How fabulous and it reminds us to really look at what’s in front of us. Absolutely incredible! I am always in awe of those who can create something where nothing existed before. And to see it in this creative medium – it’s off the charts! 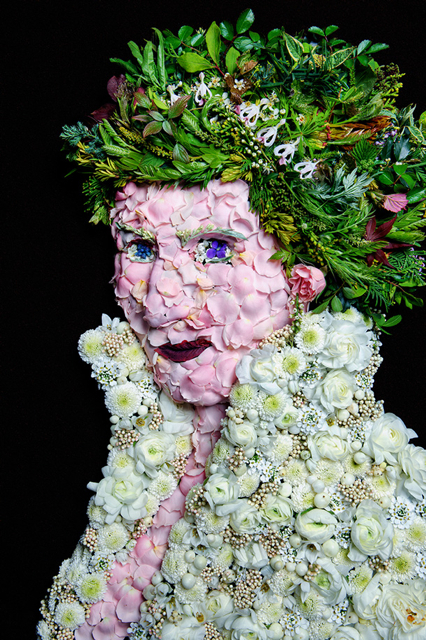 Simply amazing – I’m awestruck by the creativity! These really are amazing. I love the profiles especially. They compel you to study them for awhile. Thanks for sharing! Wow, quite arresting. 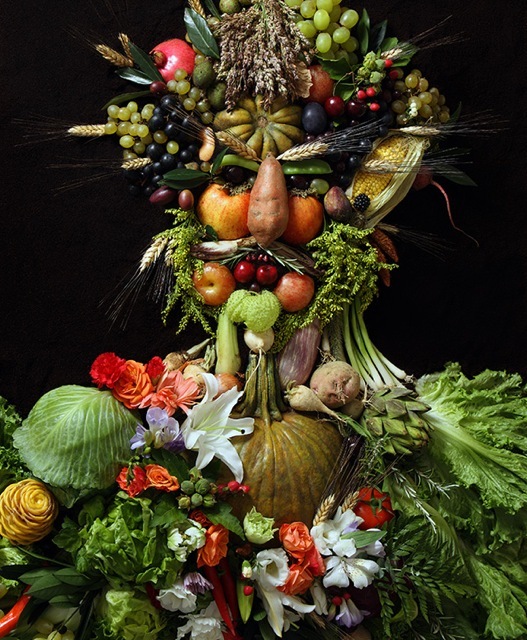 Arcimboldo always seemed so ahead of his time — I’m loving seeing how his influence continues to ripple through contemporary art and how Gerdes has made it new again. isn’t it amazing how some minds tick? 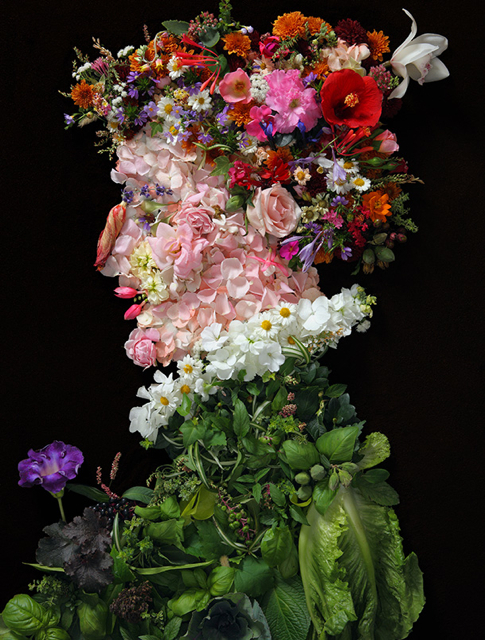 what an imagination and what a feat keeping all those vegetables and delicate flowers fresh. 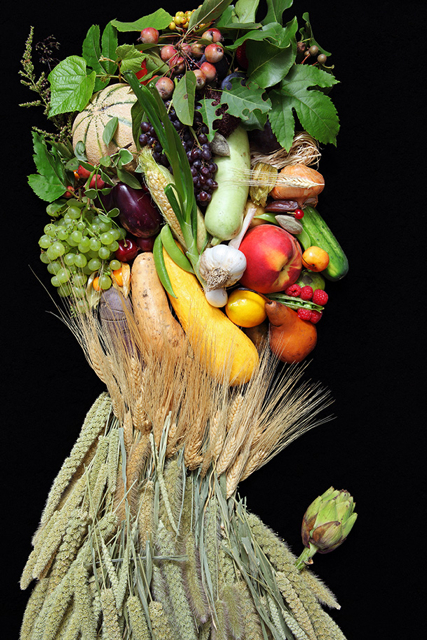 Yes, you can play with your food! so cool! I can only imagine how hard it was to set up the collage and then photograph it. So creative. These are so cool, just love them! Esp the flower petal ones. This is amazing! He has certainly separated himself from the rest. I really love his work. Talented is an understatement. AMAZING! Wow, I’m blown away. That is what you call art! I’m truly in awe. Thanks for opening my eyes to something so wonderful. So great- I have been fascinated by Arcomboldo since I studied the paintings at the Ecole du Louvre. Good to know someone has modernized this art form. 79 queries in 0.473 seconds.